Copa América, healthy competition or ferocious business? The Copa America is one of the most watched sporting events in the world. The BBC estimated that the 2011 Copa América was seen by more than five billion people worldwide. Its market value has increased immensely, especially in the last three decades, just like the World Cup. 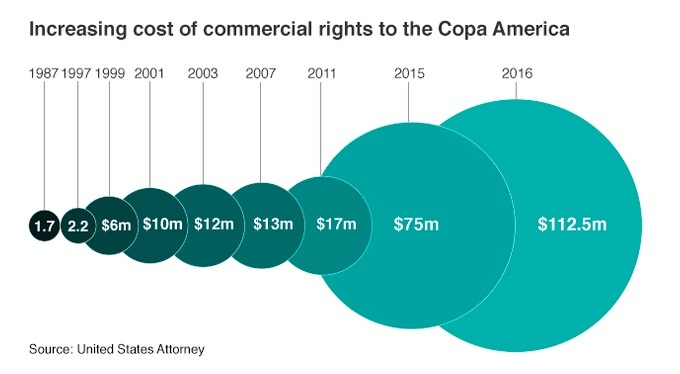 Commercial rights for this year’s Copa America were sold for $75 million dollars while the same rights were sold in 1987 for $1.7 million, a difference of more than $73 million in less than 30 years. Just two weeks ago a large FIFA (Fédération Internationale de Football Association) corruption scheme was uncovered, which really wasn’t much of a surprise. On May 27 in Zurich, Swiss authorities arrested several FIFA officials for corruption. They stand accused of a range of crimes including fraud, money laundering, and extortion. According to Reuters, the estimated total dollar amount in bribes exceeds $10,000 million in 19 years. Most of the coverage of this corruption scandal has focused on the World Cup, but the majority of the charges by the United States judicial authorities affect the commercial rights of international football in the Americas, particularly the biggest soccer tournament in the Western hemisphere, the Copa America. Despite these recent developments there is still a strong public desire to see national teams compete, and social media is full of messages supporting the teams and their players. The Copa America’s inaugural game took place on Thursday, June 11, between Chile and Ecuador at the National Stadium of Chile. The executive producer of Radio Ambulante, Daniel Alarcón, sat down to chat about the tournament with three friends and colleagues, all football fans: Juan Pablo Meneses, Chilean journalist and author of “Children Footballers’; Hernando Alvarez, director of BBC World, and Gerardo Lissardy, Uruguayan journalist and BBC correspondent in Rio de Janeiro. Click here to listen to the football roundtable on this special episode of Radio Ambulante.